It must be almost five years ago that I read Robert Lowell’s letters, and ever since then I have been meaning to read his complete correspondence with Elizabeth Bishop. I was given Words in Air several years ago for my birthday and only just recently finished the colossal tome. It is now impossible, at least for me, to think of one poet without the other, or write about them in that vein, as their friendship, which lasted three decades, survived wars, revolutions, failed marriages, breakdowns and supernumerary love affairs and influenced both their lives and their work more than any of the other tribulations. The two were bound by an ineffaceable connection fortified by a “love that was more than love”, which Lowell once surmised in a letter by saying: “You and I are simply one”. Albeit their love never took form in a physical sense, Bishop was the only constant female fixture throughout Lowell’s life, and for his part, he envisaged the two of them together, “till life’s end”. Many have viewed Bishop’s life and career, independently of Lowell, through her longstanding relationship with Lota Soares, her “secret problem” with drink, and “the smallest of oeuvres”, a mere 70 poems which saw her status elevated to one of the greatest “20th-century poets” on par with the likes of “T.S. Eliot, W.B. Yeats, Wallace Stevens and W.H. Auden”. Even more ascribed this framework of interpretation to Lowell, whose canon burgeoned with fervid alacrity and gathered readership with every volume while Bishop’s remained exclusive compendious and obscure. But for me the two poets have almost always been intrinsically linked together, not only through a lifetime of letters and personal histories but also by an incomparable “conjunction of the minds,” parallel and infinite. Bishop was an alcoholic, Lowell a manic depressive; both were consumed by their craft and an unshakable “dry loneliness,” often finding solace in one another and the thought of freeing themselves from the manacles of social-reality and people’s “universal good-will” by fleeing to Paris or Italy to spend their “declining years”. 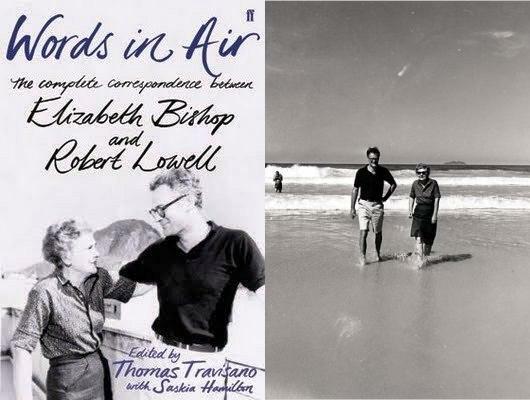 Elizabeth Bishop was introduced to Robert Lowell in January 1947, at dinner party in New York hosted by Randall Jarrell. An exceptionally reticent woman with a, “round face and very thick, unruly, greying hair,” Bishop felt immediately at ease in Lowell’s company and the “backward and forward flow” of supererogatory correspondence commenced immediately, ending only with Lowell’s death in the late 70s. When Bishop wrote the innate shyness which beset her in public was cast aside and thus Lowell was one of very few people cordially inaugurated into this very private woman’s inner life and imagination. Shortly before his passing Lowell wrote to Bishop, “you [have] always been my favourite poet and favourite friend,” and the feeling was wholly mutual. Reminiscing about Lowell looking a “bit rumpled and unkept” with a “large smear of ink across his chin,” Bishop simply concluded that she “loved him at first sight”. In the early years of their friendship the two passed through a shifting and ambiguous phase of mutual attraction, which never developed into anything other than a near proposal of marriage on Lowell’s part during a “long swimming and sunning Stonington [Maine] day” in 1948 when Bishop disclosed to Lowell otherwise uncharted key aspects of her early life. Neither Bishop nor Lowell mentioned the matter again, but their correspondence moved forward year by year. Lowell would send fresh batches of poems in wait of critique from his “unerring Muse,” but the letters were equally and mutually influential in both their individual artistic development and their personal lives. They emerge in a swirl of vividly-recorded quotidian experiences, full of impromptu snapshots drawn from the casual, peculiar, maudlin and happy domestic moments. Such moments punctuate the letters throughout, their tone often wry and witty but always and consistently sympathetic and longing, and of a literary genre in themselves. The interchange records an unfolding intimacy, a colloquial brilliance and a wealth of literary and social history of the American poetry scene and its outstandingly talented mid-century generation. But above all, they unveil a remarkable connection between two lives inexorably linked together till death, which came to Lowell in a form of a heart attack in a New York taxi in 1977 and two years later for Bishop who died of a cerebral aneurysm. Their legacy remains characterised by two people who wrote exclusively to and for one another until the “imperfect end”. I am ashamed to admit that I was barely familiar with either poet and knew nothing at all about their extraordinary relationship. You have made them come alive for me in this post. I am suddenly deeply intrigued by two people who meant nothing to me ten minutes ago. A rare connection they must have had. I know I have said this before (often), but you have a rare talent, a great gift. I am hugely impressed. I believe it is. They’ve got a tiny editorial team and are still going. It’s rather good, I think. Thank you, as always, for your lovely loveliness. A beautiful friendship, beautifully presented by you, Dolly. It was a deeply romantic affair, all the better for being captured in poetry, rather than consummated in reality. Traveling through Europe I have just recently become acquainted with Robert and by extension Elizabeth by researching poets who had lived in Florence, Italy. Literary pursuits take you down exciting alleys.